When we feel pain in the arm, we rub it. When our stomach feels uncomfortable, we rub it. It is natural to treat the area where the pain is. It is not natural, and not intuitive, to treat places far away from where the pain originates. However, this is what acupuncture does all the time. This is where the miracle of acupuncture lies. The standard explanation in the ancient text is: When qi does not flow, pain occurs. When qi flows, pain disappears. Pain is treated to enable the flow of qi. But what is qi? ▪ Qi is oscillation of the meridians. More precisely, qi is quantum oscillations on the system of meridians. ▪ Qi is what carries the effect of acupuncture from one acupoint to other parts of the body. The oscillations on the meridians are like oscillations on a piano wire. When we hit the piano wire, the wire oscillates, and we hear the sound. We cannot see the propagation of sound from the piano wire to our ear, but we feel the oscillation of the piano wire if we use our hands to touch the wire. The sound in the air is the oscillation of air molecules. We cannot see the oscillation of air molecules, but when sound hits our eardrum, we hear the sound. Sound has energy, and carries a type of message to the ear. When a needle is inserted into an acupoint, the patient will feel a little pain. More sensitive patients will feel qi moving along the meridians. Qi is the oscillations of polarized media in the meridians (which are most likely made up of stable water clusters with permanent electric dipole moments). We cannot see the propagation of qi with our eyes, but when qi reaches the problem area, we can use infrared image techniques to see its effect. Fig. 2A: Before acupuncture treatment. The hottest part of the arm is shown in white. The maximum temperature is 37.33° Celsius The four white-hot areas are quite separate. Fig. 1A: Patient before acupuncture. Fig. 1B: Patient 14 minutes after receiving acupuncture at acupoint zu san li (ST 36) of the upper anterior leg. 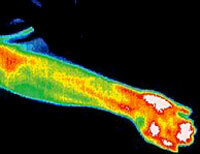 In Figures 1A and 1B, we show a thermograph of a patient. The color code of the thermographs is as follows: the hottest temperature is represented by white, then red, yellow, green and blue. with the coldest temperature represented by black. Fig. 2B: We deliberately inserted one needle at a non-relevant acupoint (Li 13) for one minute. that area increased in temperature slightly to 37.59° Celsius. Three of the four white-hot areas increased in size and joined together. Fig. 2C: We then inserted one needle at a relevant acupoint (LU 5) for one minute. All of the white-hot areas shrank; one area actually disappeared. The hottest temperature was reduced slightly to 37.2° Celsius. The patient reported feeling dizzy. 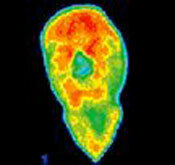 We took a picture of his face (Figure 1A). It showed hot regions around the eye and mouth, with maximum temperatures at 36.2°C and 36.02°C (in white), respectively. Since the hot area (in red) around the mouth followed the Stomach meridian, I asked him if his stomach was unwell. He said that it was. I decided to use one needle on acupoint ST36 (zu san li), just below the left knee. 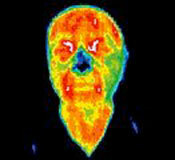 In 14 minutes, another thermograph was taken (Figure 1B). The pattern of color on his face had changed. The white-hot spots around the eyes and month had disappeared. Quantitatively, the maximum temperatures of the area dropped to 35.76°C and 35.4°C, respectively. This is a decrease of 0.44°C and 0.62°C. The decrease is significant, because the infrared camera is accurate to 0.01°C, and normal standard deviation is about 0.25°C. When I asked the patient how he felt, he replied that he felt better. Inserting a needle at a distance from the area of complaint would be effective, according to some acupuncture textbooks, as long as the same meridian passes through both areas. This assertion is proven visually. A meridian acts like a pipe guiding qi along its path to various parts of the body. What if acupoints and meridians are chosen incorrectly? Do they have the same effect? The answer is no. They do not have the effect we want. In one case, we deliberately chose the wrong acupoint to ease the pain in the hand. 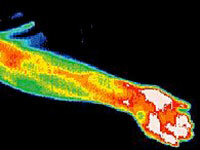 We basically heated up the hand instead of cooling it down as shown in (we feel) an uglier picture, in Figure 2B. The case is one of a patient who underwent acupuncture because of pain in the hand due to repetitive work. The color code is the same as with the previous set of thermographs. Results were distinctively different for acupuncture at the right or wrong acupoint. Only acupuncture at the right acupoint achieved the desired result of reducing the high temperature at the painful area closer to the hand's normal temperature. We can understand the above phenomena simply by using the analogy to sound. If we hit a piano wire, we hear a beautiful sound, but if we hit a stone, we hear an ugly sound. If we hit cotton, we hear no sound. The analogy to sound actually goes further. The smallest lump of sound energy is called a phonon, which is described completely by quantum field. The idea of the phonon is extremely powerful, and goes beyond our daily understanding of sound. It is essential for the establishment of the field of solid-state physics, which is the basis of semiconductors, transistors and computer chips. For example, the energy of phonons accounts for most of the heat energy of a solid. The warmth of a solid is due to the flow of phonons inside the solid. The interaction of phonons with electrons at low temperature is instrumental to bring about superconductivity as first shown in the Bardeen-Cooper-Schrieffer (BCS) theory more than 40 years ago. The smallest lump of qi energy is defined by us to be qion. Qion is like phonon and is described as completely by quantum fields. The idea of qions would become extremely powerful. Qions would be important to human life. Without the flowing of qi or qions, a warm, living human body would become cold and dead. Do we really need such a sophisticated quantum field theory for qi? The answer is yes if we want to describe the creation of life. The only physical theory at the moment that deals with creation and annihilation of anything is quantum field theory. The quantum field theory was originally created to describe the creation and annihilation of light, and then used to describe the creation and annihilation of sound, electrons and other substances. To use quantum field theory to describe the creation of life and death is very natural, because creation and annihilation operations are intrinsically incorporated in each quantum field. * If the present formulation of qi is correct, we may detect coherent infrared radiation, or even more speculatively, the existence of superconductivity in some state of a human being in the not-too-distant future. Then the field of acupuncture and Chinese medicine would have a totally new space to expand into just as our understanding of solid expands enormously when quantum field theory is utilized. Qi has many meanings in Chinese medicine, just as "energy" has many meanings in the English language. When "energy" is used in physics, however, it is precisely defined and measurable. Its meaning is objective and not arguable. Energy is exactly conserved quantitatively. Similarly, here we define qi in a narrow and precise manner as oscillation on the system of meridians, branches and capillaries so that it is quantified and measurable with detectors, so we exclude other meanings of qi cannot be described by oscillations. Qi, then, has a strict meaning with precise consequences in that it will be calculated, predicted, and measured by a variety of yet-to-be-constructed instruments. The principle of these instruments is well-known, and used extensively in physics. They need to be modified to apply to human beings. When such instruments are invented and used, Chinese medicine is expected to make a quantum leap into a new era of rigor. Additional theoretical and practical information may be found in Shui Yin Lo. The Biophysics Basis for Acupuncture and Health. Dragon Eye Press, 2004. The above entry was first published as "What Is Qi? Can We See Qi?" by Yin Lo, Phd in Acupuncture Today, September, 2004, Vol.05, Issue 09.